On December 31, U.S. President Donald Trump signed the Asia Reassurance Initiative Act (ARIA), which promises to bring back fresh focus to American priorities in the Indo-Pacific. The Act assumes particular importance in the context of China’s expanding and aggressive footprint across Asia, Africa, Europe, and Oceania and the responses by the United States as well as its allies, partners, and friends in the region. India for one has three specific areas of concern that it would want the United States to address. Within South Asia, there are two: India is worried about the prospect of American withdrawal from Afghanistan as well as about the inroads that China is making in India’s neighborhood. A third concern is more broadly the challenge that China poses to India, both militarily and politically. So, New Delhi is likely to judge this Act on how it will address these three challenges. India will be happy to have been accorded special importance under the Act, which reiterates India’s significance in the U.S. strategy in the region. The Act notes India as a Major Defense Partner, a “unique” status for India, which would ease defense trade and sharing of technology, including “license-free access to a wide range of dual-use technologies” as well as promote greater coordination on security policies and strategies and increased military-to-military engagements. Of course, in practical terms, this doesn’t change very much. Nevertheless, the symbolic element is always important while dealing with New Delhi. Of course, the congressional action comes immediately after Trump’s decision to withdraw U.S. troops from Afghanistan. Whether the congressional action will slow down or alter American withdrawal remains to be seen. Trump is reportedly considering changes to his approach to Syria, including slowing down a reduced presence. On the other hand, he also dismissed the Indian contribution to Afghanistan as nothing more than a library. 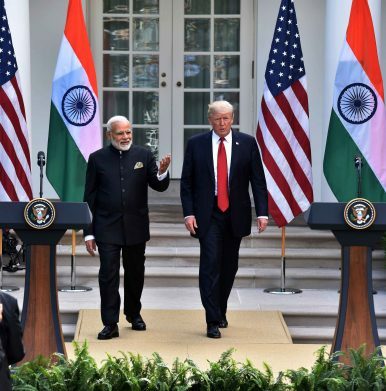 Given India’s sensitivity to developments in Afghanistan, New Delhi will be very interested in whether the U.S. Congress can moderate Trump’s instinct to withdraw. A second regional issue is China’s expansion in India’s neighborhood. China’s enormous wealth and its remarkable capacity for infrastructure building has made it an attractive partner for India’s neighbors, despite the threat of being sucked into a Chinese debt trap. Beyond this, the comfort of having an extraregional great power as a counter to the regional hegemon was probably an equally important factor. India’s limited capacity to provide an alternative has been an issue. The Act does talk about countering China’s coercive economic policies, but New Delhi would be interested in seeing whether this will provide any help to India’s neighbors in escaping China’s debt grasp. A third issue is whether this Act will reassure India in its direct confrontation with China. Like other powers in Asia, India has also sought a more accommodative policy toward China over the last year. Change of leadership in the Indian foreign ministry was one factor, with Vijay Gokhale replacing S. Jaishankar in January 2018. Jaishankar was known to be an advocate of closer U.S.-India relations while Gokhale appears to be a much more traditional Indian Foreign Service officer who prefers equidistance from both the United States and China. But more than personality factors were at play in India’s pursuit of closer ties with China. Though the Indian military stood fast in the 2017 Doklam crisis, the Indian military’s overall preparedness is rather poor. Indian military budgets are lower than they have been in decades and corruption scandals and bureaucratic incompetence have delayed necessary acquisitions. Another issue is domestic politics. India is set to hold national elections in 2019, and there are suspicions that the Modi government did not want to be diverted by a confrontation in the Himalayas. Though these factors were important, underlying all these is a certain lack of confidence in America’s commitment to India and Asia. In that sense, this congressional action is potentially positive in providing greater reassurance, even though a lot will also depend on whether the Trump administration follows up on it or not. India, like other American partners in Asia, has had concerns about Washington’s commitment to the region. This Act is not likely to remove those concerns. But to the extent that it endorses a consensus opinion within the U.S. Congress and also expresses the broad bipartisan consensus in Washington, it is likely to be welcomed in New Delhi. What Does India’s Strategic Community Perceive As the Country’s Largest Challenge?Pulwama, Balakot, and Azhar Underscore India’s China ConundrumFrom Wuhan to Pulwama: What Remains the Same Between India and China Over Jaish-e-MohammedWhere Would India Fit in a Missile Defense Partnership in the Indo-Pacific?Seeking Capital for the Capital: Will India and China Jointly Fund Amaravati?